Posted on April 1, 2018 by Barbara H.
Posted on March 31, 2018 by Barbara H.
I don’t usually post these two weeks in a row, but I came across several good reads this week, and some pertain to Easter. Ten Things You Should Know About the Cross, HT to Challies. What If Jesus Really DID Rise From the Dead? Despite Loving Christian Parents, I Left the Faith, HT to Proclaim and Defend. Good tips for parents at the end. When a Member of Your Church Is Dying, HT to Linda. Should I Bring My Kids to a Funeral? HT to Story Warren. The Blessing of a Good Example, HT to Challies. 9 Things That Quiet, Awkward Introvert Wishes You Knew, HT to Linda. Are home renovations necessary? HT to Linda. Nothing wrong with home renovations, but all the flip and fix shows popular now can make us discontent. Posted on April 16, 2017 by Barbara H.
Posted on March 29, 2017 by Barbara H.
Although spring is one of my favorite seasons, I haven’t always decorated for it. Even as I collected some spring decorations over the years, I haven’t always gotten them out. But this year I was inspired by seeing blogging friends’ spring decorating, and I was just so glad for spring to come this year, even though we haven’t really had a harsh winter, that I almost couldn’t help bringing some springiness into the house. The little flower arrangement on the left I got from a thrift store years ago, and the arched box on the right was a gift from Jason and Mittu some years back. It’s meant to hold Willow Tree figurines and has shelves inside, but I don’t have any that small, and don’t really want any more than I have. But I just like the box. Sometimes Timothy will tuck things in there, and sometimes I’ll put something in there for him to find. Those two are on the table year round except fall and Christmastime. The ceramic water pitcher I got at a thrift store years ago, and the little flowery bunny was a Hobby Lobby purchase a while back. The little pedestal is new this year. I got the idea from Laura’s lovely spring decorations. I couldn’t find white like she had, but Hobby Lobby had these in pink, blue, yellow, and green, and they had all their spring merchandise 40% off last week. They had a package of ready-made nests with these eggs in them as well. I was originally looking for white or blue eggs, but liked these. For a long time I avoided eggs and bunnies around Easter, but after a while I felt that they are fitting for spring, and spring is a picture in a way of the resurrection. This is in the dining area and is a favorite. I forget where I got it. I don’t remember where I got that green pocket holder years ago, but I love it. It’s nice to just toss things in without having to use hot glue or a form to stick the flowers in. I had been considering the idea of a wreath with tulips and a little nest nestled in, and maybe I’ll try that next year, but for now I like this. I had an egg on a pick leftover from a flower arrangement years ago and found a package of them at Hobby Lobby, and tried a few of them in the pocket arrangement above, but it just looked too busy. I think if the flowers had been all one color, it would have worked better. I debated about whether to put any in this little arrangement, but finally settled on just the one. In addition, these two are out year round, but they do look springy! This is beside my kitchen sink. I don’t remember where I got the little pitcher: I’ve had it for years. But the flowers were just two picks from Home Interiors. I do change the flowers out for fall and Christmas. The lighting wasn’t ideal for this photo – the sun was streaming in blindingly, but when I closed the blinds and turned on all the lights, it wasn’t quite enough for a clear shot. But anyway, the cloche with the bird nest in it was from Cracker Barrel (I think I may have hinted at it for a gift for Mother’s Day one year. 🙂 ) And the little birds were on sale at Hobby Lobby a couple of years ago. The little plaque is metal and I think came from a Christian bookstore in SC. Posted on March 27, 2016 by Barbara H.
Posted on March 25, 2016 by Barbara H.
See the destined day arise! See a willing sacrifice! Every pang and bitter throe, finishing your life of woe? Hallelujah! Hallelujah! Lamb of God for sinners slain! Hallelujah! Hallelujah! Jesus Christ, we praise your name! And with tender body bear thorns, and nails, and piercing spear? Sign to all attesting eyes of the finished sacrifice. All our trust for life renewed, pardoned sin, and promised good. Posted on April 6, 2015 by Barbara H.
Songs of the Morning: Stories and Poems for Easter was compiled by Pat Alexander and includes excerpts from the writings of C. S. Lewis, E. B. White, Dickens and others, some (mostly poems) written by children. I had bought it ages ago from a clearance section, put it on my shelf, noticed it it off and on through the years, and kept forgetting about it at Easter time. Finally this year I remembered to pull it out in the weeks preceding Easter. I like to read something devotional pertaining to Easter during that time, and while this wasn’t that exactly, it was both pleasant and beneficial. I don’t think I realized, or I had forgotten, that it was geared primarily to children, probably the same age as those who would be able to read the Narnia series. But adults can gain from it, too. I like that it couches the Easter story within historical context. The first section is “How It All Began” and begins with a short excerpt from a children’s Bible about God creating the world and sin entering in (Pat Alexander also wrote The Lion’s Children’s Bible, which I had not heard of before this, so I don’t know how well it expresses Biblical truth, but the excerpts I read here were fine). Then there are Narnia excerpts about the founding of Narnia and the White Witch and a couple of other sources to further illustrate those truths. The stories come from a variety of countries. Some are old, some are new. Some are from adults’ work, some from children’s books. Some are fun, some are serious. Pat did a fine job putting all these sources together. It doesn’t look like the book is in print any more, but there are copies that can be purchased online, or perhaps you can keep an eye out for it at library sales and such. Posted on April 4, 2015 by Barbara H.
Posted on March 31, 2013 by Barbara H.
Why seek the Living midst the dead? That He would rise again. 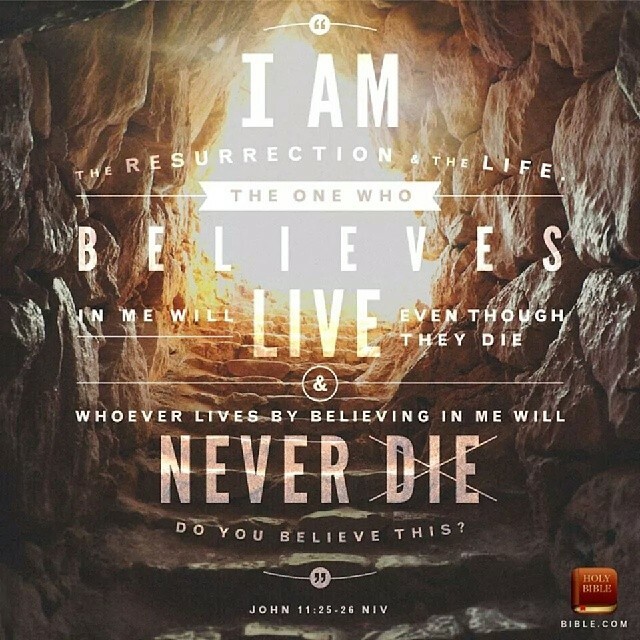 He rose and left the grave! And ever lives to save. And triumph with their King. To Thee our bodies trust. Wishing you a blessed Easter, filled joy, hope, and love because of what our Lord has done for us. Posted on March 29, 2013 by Barbara H.
The very dying form of One who suffered there for me. Face the cross, He hangs there in your place. See the Lamb upon the killing tree. As on the cross, He dies for you and me. Face the cross and see the dying Son. See His anguish and His tears of love. Face the cross, He dies to set us free. Turn not away, turn not away. His nail-pierced hands are reaching out to you, to you. Look upon the One without a sin,. Spotless Lamb upon the killing tree. So great a price, yet paid so willingly. Face the cross, face the cross. See the Lamb, upon the killing tree. As on the cross, He hangs in agony. Face the cross and turn not away, turn not away. His nail-pierced hands are reaching out to you. Turn not away, behold His wounded side. Turn not away, behold the crucified. Face the cross, and see the King of Grace.